Federal has expanded its line of Premium unprimed brass to include 6.5 Creedmoor and 6.5 Grendel cases. Shipments have been delivered to dealers. The Applied Ballistics Weapon Division announced the EnABELR cartridge in 375 and 338 calibers. It is a medium capacity, magazine feedable cartridge. GSM Outdoors announce their lineup of professional shooters and leading outdoor sports enthusiasts who will be meeting with NRA members and fans, in their booth at the 2019 NRA Annual Meeting at the Indiana Convention Center in Indianapolis, Indiana, April 25-28. Stevens’ new 555 Enhanced is light and handles fast, thanks to a lightweight aluminum receiver that’s scaled to gauge and reinforced by a steel insert. It is now available in 16-gauge. FN America, LLC is pleased to announce that South Carolina Department of Natural Resources has selected a custom-designed FN 15 Patrol Carbine equipped with agency-selected upgrades. FN law enforcement distributor, Amchar Wholesale, has delivered a total order of 265 carbines to the agency. Sturm, Ruger & Company, Inc. (NYSE: RGR) proudly announces that professional instructor and competitor Tina Martin has joined as the eighth addition to Team Ruger. Hoppe’s announces the signing of National and World Practical Shooting champion Todd Jarrett to the Hoppe’s Ambassador Program. He will represent Hoppe’s at shooting competitions, appearances at shows and assess products. Rock River Arms is now shipping a new series of semi-autos chambered in 9x19mm. Designed to work with GLOCK style magazines for optimal cross-compatibility with GLOCK pistols, the BT-9 pistol & carbine series takes shooting fun and personal defense systems to new levels. BLACKHAWK worked to create the ultimate line of duty-rated holsters – the T-Series. With its streamlined thumb-activated retention, the T-Series keeps your firearm at the ready while maintaining total security. ERGO will be showing a new product at the NRA Annual Meetings this month. It’s the TDX-0 -- Tactical Deluxe Zero Angle Grip. It’s now available in a reduced angle for comfort and control on precision rifle chassis, AR15 and AR10 platforms. Mec-Gar USA announced the addition of a 9mm 10 round CZ 75B magazine to their product line. The magazine consists of a full-size tube which is physically limited to a 10 round capacity. Cordova Outdoors, the officially licensed cooler of the National Rifle Association, now has available NRA-logo coolers for purchase through the Cordova Outdoors website. 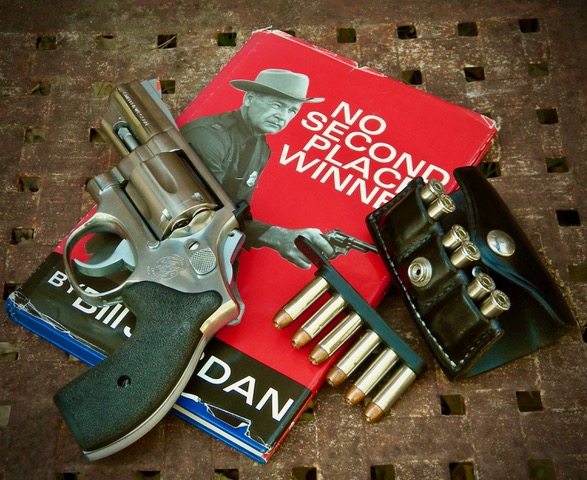 Regardless of what you carry, the "Gun Fighting" chapter in Bill Jordan's "No Second Place Winner," which focuses on mindset, is mandatory reading. In the course of defensive training and practice everyone is always worried about “speed.” They push to draw fast, move quick and hammer rapid fire hits on target. “Am I fast enough,” they ask? The ability to draw, move and shoot or perform any other defensive skill “fast” is admirable, but it’s not the ultimate goal. “Speed,” is found in making decisions. Mental efficiency, choosing to respond to violence in a timely fashion is what wins fights. Time is an important consideration, but not in the way most people think. Regardless of what you’re doing, there’s a limit on how fast you can perform. Go too fast and things fall apart, mistakes occur – which consume more time. Overall efficiency drops. Yes, it’s important to know how long it takes to draw – from concealment – and fire accurate shots. Now, factor this into your threat response. The key is identifying possible trouble before it become dangerous. If the first clue you have to trouble is someone hitting/cutting/shooting you it’s going to be hard to assemble a good response. You can still win, but it’s will be difficult. Staying aware of the environment – both terrain and the people – provides cues that trouble is coming soon. Making the decision to escape, get to cover or move and draw prior to actual violence buys time needed to actually do these things. And, there’s time to act efficiently, without mentally and physically being pressured and rushed. Plus, your reaction must force the threat into a reactive mode, which creates more time. Finally, always have your next action ready, continuing to pressure the threat(s). When faced with danger people often freeze. “I can’t believe this is happening,” they think. Or, they freeze, second guessing their initial decision, not trusting their training - “Move!” Sometimes it’s a matter of having too much time prior to the physical action – attempting to guess what’s going to happen, or thinking about the outcome as opposed to the actions needed to obtain that outcome – Victory! All defensive skills must be practiced until you can execute them efficiently, under stress and on demand. Make sure your training/practice involves decision making, like having to identify the source and nature of the danger. Responses are then based on the situation. Then, take your time to ensure these actions are correct – not fast. It’s not about the speed you perform; it is about how quick you make the decision to act.